Sometime before the age of 16, George Washington transcribed Rules of Civility & Decent Behaviour In Company and Conversation. This classic, demonstrates the character and conduct that a young George Washington esteemed as favorable. President Washington was know for his chivalry, humanity, fairness and integrity. As all great men, these qualities are acquired at a young age and practiced until they become our nature. 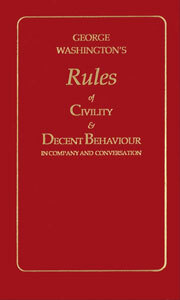 Spend some time with your children reviewing these delightful rules of civility that although written in the beautiful language of the past, ring true and faithful to behavior that is admired today. A great history lesson. 6th-- Sleep not when others Speak, Sit not when others stand, Speak not when you Should hold your Peace, walk not on when others Stop. 22d-- Shew not yourself glad at the Misfortune of another though he were your enemy. 56th-- Associate yourself with Men of good Quality if you Esteem your own Reputation; for 'tis better to be alone than in bad Company.